This product needs to be ordered in – please allow for an extra 2-3 working days on top of any orders that contain this item. A 300mm x 100mm high quality metal floor vent which provides a modern look. These floor vents have a smooth, fully closing damper operation with flush button control mechanism. 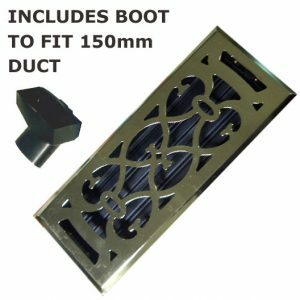 The vent also comes with a 300mm x 100mm boot that connects to 150mm flexible ducting. These floor vents have a smooth, fully closing damper operation with flush button control mechanism. 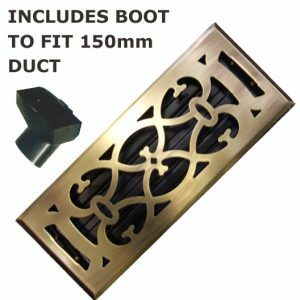 The vent also comes with a 300mm x 100mm boot that can be connected to 150mm flexible ducting.